I was asked by the South Wales Evening Post to give my views on 2013. “Universal Credit' is said by Government to become law from October 1 next year. This will have a major negative impact on the private rented sector as all benefit money will be paid directly to tenants and all grouped together in one lump through the Department of Work and Pensions. “It will be a major headache for landlords as some tenants have no idea how to budget. They will even be responsible for paying a percentage of council tax, even though their benefit allowance is being cut. Potentially, this could lead to mass evictions as tenants fail to pay landlords the rent. “The end result will be very costly to Government ultimately as they are obliged to cover the cost of emergency housing for evicted tenants. Many landlords may go bust as a result. It is a worry for landlords and I suspect many will make the decision not to rent at all to housing benefit tenants. “Interest rates look set to remain relatively low. I predict no more than half a per cent rise next year. “New business start-ups are still viable if we can actually get the banks to fund, which is a whole other problem for people who are not already showing high profits. “In our case, we plan to take advantage of low borrowing rates and expand our business by purchasing more rental properties while house prices remain relatively low and rental yields are 10 per cent or higher. “We will take on more staff. It is easy to source good people in Wales as there many are looking for jobs. It’s not great for the ‘macro’ economy, but good for businesses like ours. “We will continue to help others into new business start ups or grow their existing structures as I really love the business coaching side of our business. “I am to continue with my charity work focussing more on homeless people next year by working for the first time with Shelter and other housing charities like The Wallich. “I will also be focussing on the new Entrepreneurship Academy Wales students - to ensure the flagship Welsh Government project achieves the its target of all students having set up profitable businesses by end of their year BTec course." 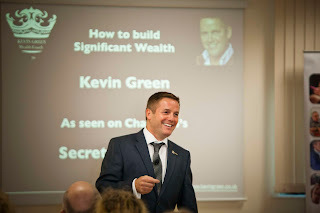 Kevin Green, 49 is a self-made multi-millionaire and social entrepreneur. He is one of the UK’s largest residential property landlords and a multi-business owner, with business interests as diverse as soil removal and software development. His current net worth is estimated to be £38 million.